Have you heard the news? FDA caused quite a stir when it recently announced transformative changes that will modernize its 510(k) program to improve the safety and effectiveness of medical devices. But as we all know, the more things change, the more they stay the same. If you dive deep into FDA’s statement, you’ll realize that there’s probably not a lot that’s different. In this episode, Mike Drues, of Vascular Sciences, and I offer an initial reaction to these changes. 10-Year Rule: Policy that a 510(k) can’t use a predicate that’s greater than 10 years old. Root cause for this policy may be due to recent news of medical devices gone bad and the challenge of predicate creep with 510(k)s.
Regulation states that to have a successful 510(k), you need a predicate; it doesn’t state a limitation for the age of the predicate. It should be up to the medical device professional to decide which predicate would be the best to use - no matter if it’s 1, 10, or 40 years old. Twenty percent of 510(k)s reference a predicate greater than 10 years old. This is a solution for 20%, not the other 80%. There’s been past movements for alternative and abbreviated 510(k) pathways. So, nothing really new or revolutionary with FDA’s statement. FDA wants manufacturers to develop newer and better technologies than what’s currently available. But should “better” be a part of a 510(k)? It’s an oxymoron. If new device increases or creates new risks than a predicate, can’t be a 510(k) - but this is not usually enforced and de novos are sometimes pursued. The 510(k) and Substantial Equivalence: Why Do So Many Get it Wrong? 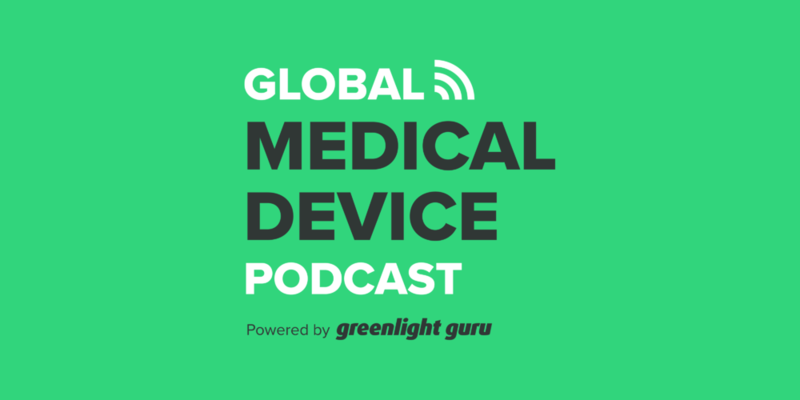 Jon Speer: Hello, and welcome to the Global Medical Device podcast. I feel like I should have that urgent noise that... For a new APB type of communication on this one. 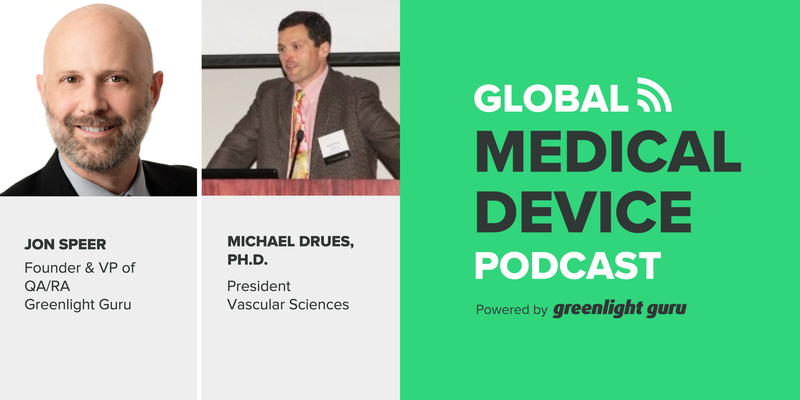 And I'm laughing a bit, but you'll see why here in a moment, but with me on the podcast today, I have Mike Drues with Vascular Sciences. Mike, has it been a busy week for you? Mike Drues: It has been a busy week, Jon, maybe you can tell the audience why. Jon Speer: Well... And I'll confess to the audience, you and I, we've recorded a conversation earlier this week. No sooner than we had finished the conversation, I looked at my email, and it was blowing up of all this news, and I'm like, "Holy cow, is the sky falling? What is going on?" And it turns out that there was a new announcement from the FDA that the FDA has taken steps to strengthen the 510(k) program, and that sort of thing. So I'm guessing, after we got off that call the other day, you probably had similar issues or similar phone calls and emails. It's been a little crazy. Mike Drues: As I'm sure we'll get into, there's really not a lot here, in spite of what our many folks at FDA and other places will tell us. There's really nothing here to me, anyway, that's new, but, anyway, we'll get into that. Jon Speer: Yeah, for sure. And folks, I wanna give you the disclaimer right away. We... From the news... From the moment that we received this news to the turnaround, and this going live is a pretty quick turnaround, all things considered from a podcast perspective on our end, we're gonna just skim the surface of some things today. This is really the initial reaction from Mike and Jon on this announcement that came from FDA. But be sure to listen in for future podcasts, where I'm sure we're gonna dive deeper, I'm sure, as the weeks happen for the rest of this year and probably even in into 2019, there's gonna be a lot more clarity about what some of these things mean. But the first thing... With that being said, Mike, there was this thing about a 10-year rule that was described in the announcement, something to the effect of FDA is going to institute some sort of policy that a 510(k) cannot use a predicate that is greater than 10 years old. So can you elaborate on that just a little bit? Mike Drues: Sure. This is another thing that, much to the chagrin of some of my FDA friends, this is not a new idea. This is, in fact, an idea that a number of people have proposed often on over the many years. And, really, most of our audience, Jon, are engineers. Engineers are used to thinking about the root cause of a problem. So before we talk specifically about this 10-year issue, let me put you on the spot a little bit, Jon, what do you think is the root cause of this 10-year proposal which you just described, not allowing any medical device companies to use a predicate for a 510(k) that is more than... That was cleared more than 10 years ago, which, by the way, I have always been adamantly against, and I'll explain why in a few minutes. Well, what do you think is the root cause? What do you think is driving this? Jon Speer: That's a great question. To me, the timing of all this is a little bit auspicious, and you and I talked about the Netflix documentary a while back, when that came out. I had some responses to some of the things that were discussed in that documentary, but, interestingly, within the past week to 10 days or so, there have been a lot of similar articles and content that have come across my desk, things from everyday news organizations, where they're covering stories that a device has gone bad, and this and that, and so on and so forth. I've seen quite a bit from the EU side of the world, similar types of stories, where devices... There's been some issues from Australia as well. So, to me, if I were to speculate, and I know that's not a good thing to do from a root cause perspective, but it seems to me that this is some form of reaction to some of the, I'll say, negative press about regulatory pathways and device clearances and leveraging quote 'older' technologies to get products to market. That is my gut reaction. Mike Drues: Well, I love your gut reaction. I certainly have a lot of respect for you and your professional experience, and, yes, I agree with you, that all of the stories coming out in the popular press, including the Netflix, but all of the more recent ones, are all parts of this, but there are still symptoms. They're not the real root cause. Let me... To use what my attorney friends like to say, let me lead the witness, let me give you the answer, and then perhaps you can explain, 'cause I know you know this, Jon. I'm just trying to tease it out of you. Mike Drues: I would argue that the root cause of most, if not all, of what we're talking about here is one of the most significant challenges with the 510(k), and that is predicate creep. How would you describe to the audience, Jon, if you're familiar with that phrase, what does predicate creep mean? Jon Speer: Oh, sure. So that, yeah... And thanks for leading me along. I hope I end up where you're anticipating. But the whole idea with predicate creep. So let's just imagine that I bring a device to market under the 510(k) pathway, and time elapses, changes. I start making changes. I have to find a new material or a new supplier, or tweak this or modify that for a device that's under... That was cleared under 510(k). And, in each and every time, I go through my decision trees, or what have you, and let's just imagine each time that I make one of these small somewhat, let's say, incremental changes, I determine that there's no new submission required, from a regulatory perspective, that instead, I document this in a letter to file, but now, there's a couple of years that have elapsed from the time that I got my clearance to my current product. And if you were to compare that initial 510(k) device to the one that I have on the market today, they may look different enough to where one might say, "Hey, are those even the same product? Do they have the same... Should they have been... Do they both fall under that same 510(k)? Mike Drues: Well, I think you're awfully close, Jon. I think what you might be describing is more along the lines of change creep as opposed to predicate creep, but maybe I just misunderstood. So let me offer the audience my sort of... The way I like to explain predicate creep. So let's say we bring a device onto the market today and we compare it to a device that was brought onto the market two years ago, the changes between our device in the predicate over that short two-year period of time are not significant, and therefore, we're able to bring it onto the market as a 510(k). When we look at the device that was brought onto the market two years ago, it was brought to the market by comparing it to what was on the market, say, two or three years before that. Once again, the changes over that short incremental period of time are insignificant, and a 510(k) is justified. When you start to now add these changes up collectively over the nearly 45 years that we've been playing this game, since the 510(k) was created in 1976, even those small incremental changes, when they're considered individually over a short period of time, they don't seem to be significant, but when we add them up over the four plus decades that we've been doing this, those changes become significant. And that, I think, is the root cause. This is exactly why the Institute of Medicine, about a half a dozen years ago, said to the FDA, "We should throw away the entire 510(k)." Mike Drues: As I've said many times, publicly, and I think you and I have talked about this, Jon, I was adamantly against that. I think that the 510(k) is a pretty good program. It's not a perfect program. It's a pretty good program, and we should definitely not throw it away because that would be like throwing the baby out with the bathwater, but we definitely need to talk about making some improvements, and one possible solution to the predicate creep problem that people have been talking about for a long time... And, again, it's just personally frustrating to me when people announce these things as if they were a new idea, 'cause it's not, is to put a time limitation on the predicate selection that we can use. In other words, as you know, Jon, the regulation says that in order to have a successful 510(k), we have to have a predicate. The regulation does not say how recent or how old that predicate needs to be. Mike Drues: And for what it's worth, I've maintained publicly for my professional career, the regulation should not say that. It should be up to me, as a medical device professional, to be able to decide which predicate would be the best for me to use in my particular situation. Whether it's from one year ago, 10 years ago, or 40 years ago, it makes no difference, but, behind my decision, I stand by the fact that we should be responsible for our decisions, and it turns out... If it turns out that there are problems later, we need to be responsible and we need to address them. Does that make sense, Jon? Jon Speer: It does. And what I find interesting about this change that's being talked about is in the FDA report as well as in a lot of the other general press articles on the topic, it does mention that of the 510ks, 20% of them reference a predicate that's greater than 10 years old. So it's like this is a solution to the 20% challenge, not the other way. And I guess I've always kinda been a fan of let's deal with the 80/20, not the 20/80. I don't know if you have any thoughts to that. Mike Drues: No... Well, I think that's a good point. That's an important statistic. Putting things in context for the benefit of the audience, FDA cleared about 3200 devices last year under the 510(k), that was a little over 80% of all devices coming to market. So, this is another reason why this is generating so much press. And, as you just mentioned, about 20% of those were cleared by comparing their device to a predicate that was on the market... Market more than 10 years ago. So, if you do the arithmetic, that's about 650 devices that were cleared using those old predicates. Now, the details of this are still a bit sketchy, but I've been involved in devices, Jon, where if we had an absolute requirement... And I know FDA does not have this in mind, but if we have an absolute requirement that you cannot use a predicate more than 10 years ago, there have been devices that I've been involved with, where there has been no new device come onto the market, and it would be impossible, even if we wanted to use the device within one decade, because there wasn't one. So, bottom line, I think another reason why this idea is being proposed is because, from a regulatory perspective, it's a very easy solution. If Congress wanted to get involved here, it would be very easy for them to just impose a regulatory requirement, no predicates more than 10 years old. Mike Drues: But I think that... Let's put it this way, that would be hamstringing me, not just as a regulatory professional, but as a professional biomedical engineer, from making the best recommendation to my particular customer that I can. I don't want that kind of a limitation. Jon Speer: Yeah, the other thing that I find interesting about this announcement is that this quote 'new approach' is being tagged as the quote 'safety and performance-based pathway'. I know you have a reaction to that. Mike Drues: Well, listen, it's a very admirable goal, and let's be honest here, as you and I have acknowledged many, many times, FDA has a very important job to do, and as I've said before in our conversations, physicians can kill patients one at a time, but an FDA reviewer can kill patients thousands at a time. And that's a perspective that none of us in industry should ever forget. But, on the other hand, I would like to think that every medical device pathway to market, and, for that matter, every drug and biologic and combination product and everything else's pathway to market would be the same thing. So I don't think there's anything unique here about the 510(k) in that regard. Mike Drues: Well, first of all, Jon, I think one thing that's important to point out for our audience is that, at least as of when you and I are having this conversation today, nothing has changed in terms of the regulation. In other words, Congress has not weighed in on this yet. FDA can propose whatever, quite frankly, they want to propose, and they can implement whatever they want via guidance, but let's all remember, regulatory 101, guidance is only guidance, it's not guidance... Sorry, it's not regulation, unless and until Congress does come in and change the regulation. And I'm not suggesting that they should, certainly not with regard to the 10-year limitation. Nothing here is binding, so... So that's one thing that everybody needs to worry about... Needs to remember, and that this is all talk, this is all hearsay, as the lawyers would call it. Mike Drues: But, nonetheless, it's good to have this conversation. And one other point I thought I would bring up, Jon, a lot of the justification that we're seeing from FDA is to making these changes, or at least proposing these changes, is that FDA, to their credit, they want to encourage manufacturers to develop newer and better technologies than what we currently have. And, listen, as a biomedical engineer, I'm a 100% in favor of that, but is it just me, Jon, or is it somehow an oxymoron to put better devices in the same context and in the same sentence as a 510(k)? Jon Speer: Yeah, I love this quote from the press release, and this is verbatim, quote 'the most impactful way that we can promote innovation and improve safety in the 510(k) program is to drive innovators toward reliance on more modern predicate devices or objective performance criteria when they seek to bring new devices to patients.' It does seem like an oxymoron, right? Mike Drues: And I hope, for the benefit of our audience, especially those in this audience that don't have as much of a historical perspective as Jon and I, I hope that you all appreciate our not-so-subtle use of humor here, because these are very important issues for all of us, not just in this industry, but in society, to be talking about. And, Jon, I'll just remind you of what somebody... A very good friend of mine said in one of my favorite YouTube videos, Jon Speer, in his video describing the 510(k), and he was absolutely brilliant in using ketchup and mustard, and basically wanting to use... Bring ketchup on to the mustard, using... Sorry, I should let you explain it, Jon, but bringing ketchup on to the market by comparing it to mustard. And one of the most important points you made in that video is you want to say that it's basically the same, you do not want to say that it's better. Mike Drues: And this is absolutely not a new issue, Jon. This is something that the medical device industry has been struggling with since the 510(k) was created in 1976. And, basically, what I mean by that is, from a regulatory perspective, when you take your device to the FDA as a 510(k), you absolutely do not want to say that your device is better, you wanna say that it's the same. And yet, when you get your device on the market, your marketing people don't want us to say that it's the same, they want to say that it's better. So how can something be the same and yet better at the same time? I have absolutely no idea, Jon. Jon Speer: I don't know either. Mike Drues: But it's the dance that we've been playing since the 510(k) was created in 1976. These are the kinds of discussions that we need to be having with FDA and within industry, not this kind of simple-minded solutions of limiting things to 10 years. Jon Speer: You and I were talking the other day, and it's not... I think it's somewhat related to this topic, but it actually was a conversation that you and I had had prior to this press release, and you were sharing a story... You had done a pre-submission, where, I think, you were proposing a 510(k) path, if I remember correctly, and one of the FDA reviewers of the pre-submission had pointed out that there was some new or different risk with your proposed device that would basically eliminate the 510(k) pathway. Do you wanna elaborate on that a little bit and maybe connect some dots or how that might be related to this announcement? Mike Drues: Yeah, it's a great question, Jon. Thanks for asking me to chime in. And, by the way, this is a story that I shared now with virtually all of the companies that I've talked to since the last month or so, when this has happened. In a nutshell, the regulation, since 1976, when it comes to the 510(k) and risk, has always said that if your new device creates any new risks that are not in the predicate, or if it's an increase in the risk, in other words, greater than an existing risk or a known risk compared to the predicate, that would, by definition, kick you out of the 510(k) universe. However, I can tell you, Jon, that that regulation has never been enforced literally in the 40 plus years the 510(k) has been around. Because, if it was, how can you possibly explain the fact that the number of de novos coming through the FDA are absolutely miniscule compared to the number of 510ks? I would challenge anybody in our audience, or even at FDA, for them to bring up a device that was brought onto the market in the past, that did not have some new risk that was not present in the predicate device, and yet, it was still brought onto the market as a 510(k). Mike Drues: I challenge anybody in the industry or FDA, I can... As a professional biomedical engineer, with a little bit of thinking... And keep in mind, Jon, as I've said before, I happen to be a subject matter expert in FDA, for FDA in a few areas, including risk. I'm very confident, it sounds like a bold statement, and it is, but I'm very confident that I could come up with some new risk, and yet, it was still brought onto the market as a 510(k). So, the question... The experience that you alluded to was a pre-sub that I had about a month ago. Obviously, I don't wanna get into the details of it, but at least I have now one data point, that FDA is trying to raise the bar, encouraging the company to do a de novo. Now, to be fair, I encouraged the company to do a de novo before we did the pre-sub because, as you know, Jon, I'm a big fan of the de novo. But the company wanted to at least give the 510(k) a shot, and so that's what we did. Mike Drues: The question is, is this the beginning of a new trend. In light of all of this chatter that we're hearing about the 510(k), I would not at all be surprised if this is one of the first data points, that, ultimately, constitute a new trend, and if that's the case, and I said this to somebody just in a conference call earlier today, with one of my existing customers, don't be afraid, don't be surprised if we start to see a significant increase in de novos in the future. I think part of the motivation for FDA to do that is because that would be a more legitimate explanation of encouraging companies to develop new and novel devices, because, let's be honest, Jon, to say that a 510(k) device is new and novel, that's just... I'm sorry, that just, to me, doesn't make any sense. Jon Speer: Yeah, I echo that as well. Folks, I wanna remind you I'm talking to Mike Drews with Vascular Sciences, and we're skimming the surface today on the recent press release from FDA about changes to the 510(k) program. And, with that in mind, Mike is doing a webinar with Greenlight Guru on December the 6th, at 1:00 PM Eastern Time, and the topic is very, very relevant to what we're going through or what we're talking about today, and the topic of the webinar is The 510(k) and Substantial Equivalence, why do so many get it wrong? So, be sure to... It will include a link to sign up for that, but you can also go to www.greenlight.guru, to the webinar page, and sign up for this as well. It's absolutely free, it's information that will help you as a regulatory professional. But, Mike, it is interesting that if we do think about that, it's speculation, of course, is this a precursor for things to come? Is this an indicator that... That maybe there would be more things that now don't qualify for 510(k), that are gonna be pushed for that de novo pathway? Jon Speer: And we've talked about that before, there are pros and cons. There are times when that makes sense and that sort of thing. I know we're not gonna get into that today, but, folks, it could be an early indicator. And, Mike, I recall, when you and I were chatting the other day, we were talking about trends. It's easy to spot the trend after something has happened 10 or 15 times. It may not be as easy to identify a trend with a single data point or two. So, do you wanna elaborate on that in any way? Mike Drues: Well, here's how I would sort of wrap this up as we approach the end of today's discussion. And, believe me, I think this is gonna be just a continuation of what will be many more discussions in the future, not just between you and I, but I hope with a broader audience. Look, let me be crystal clear. As I said earlier, and I mean this sincerely, the 510(k) is a pretty good program, but it is, by no means, a perfect program. And anybody that's in our industry that says that the 510(k) should not be changed, with all due respect, is just not doing a service to our industry. We need to have discussions like this on how to make improvements. I, personally, as I said, am not in favor of a 10-year limitation on predicates, but I am strongly in favor of having discussions on how to make other improvements in the program, to identify what, I think, is one of the most significant challenges to the 510(k). Mike Drues: But, more broadly, if FDA is genuinely interested in encouraging companies to not come out with more and more me toos, but instead to come out with new and novel technologies, I don't think tweaking the 510(k) is the way to do it. I think what we need to be just talking about... And, Jon, obviously, we have a lot of people in industry that listen to our podcast, but I'm also proud to say that I have a number of my FDA friends that also listen to some of our podcasts, although I'm sure none of them would ever admit to that publicly, but I'm gonna say this for my FDA friends, we need to do more to encourage medical device companies to not be so afraid of pursuing a de novo. And I'll share with you what one of the people at this particular pre-sub meeting said. That person said the amount of work, at the end of the day, that goes into a 510(k) or a de novo, in terms of bench-top testing, clinical testing, if there is any, and so on, is the same, 510(k) versus de novo. That person said, "What difference does it make?" And I said, in response, "Welcome to my world." Because there are still an awful lot of people in our industry who will assume that because they do a de novo, it is, by definition, more work than a 510(k). Sometimes that's the case, but oftentimes, it's not. Mike Drues: So I think that we need to be educating people on truly what the advantages and disadvantages are so that we can all make the best decision that we can, given the circumstances that we're in at that time. I don't know if this makes any sense to you or your audience, Jon, but I'm trying to put a positive spin on all of this negative press, like the sky is falling. I don't think the sky is falling. Jon Speer: I don't think so either. I agree with you wholeheartedly. And folks, as we do wrap up this conversation, there is a ton of information, I'll use the word information loosely here, there are... Maybe better-stated, there are a ton of articles on this topic. Jon Speer: More come out each and every day, and I would expect now for the next, probably, a week or so, there will be additional articles and content. My advice to you is to try to get to the facts. As Mike led this conversation today, there probably really isn't anything dramatically new in this announcement. You can peel back the layers, you can dive into the details, but reader, beware, you can do this... I haven't read the fraction of the articles that I've bookmarked, because there are so many of them, but the more you read them, then it's just... It's redundant, it's saying the same thing, it's putting different spins on it. But try to get to the facts as best as you possibly can. And to Mike's point, and what we talked about a moment ago, safety and performance, that's bread and butter for any medical device, you should absolutely 100% be focused on that, regardless of that regulatory pathway. The regulatory pathway, my way of looking at it, is sort of a means to an end, and what I mean... That means to get your product to market. It's sort of semantics, if I might be so bold to say, if you wanna think about whether it's a de novo or a 510(k) or a PMA, the work, the effort that's required is still there. The regulatory piece is somewhat irrelevant, at the end of the day. Jon Speer: I know that's kind of a bold statement, some might be rolling over, jumping up and down, saying what I just said is crazy. But folks, you still gotta do the work, you still gotta be able to demonstrate safety and efficacy of your product. Mike Drues: Absolutely correct, Jon, and the very last thing that I would just offer for you and your audience, in terms of historical perspective, because I know that we have a lot of folks that listen to us, that are relatively new to this industry, so, when Jon and I talk about the fact that there's really nothing new here, that these issues have been talked about for a long time, I'm not talking just simply about the discussions in the articles coming out in the last weeks or even months, or even the last few years. Some of these articles go back decades. As a matter of fact, my... One of my favorite articles, Jon, it was an article published in Popular Mechanics magazine, called Danger in the Hospital. It was one of the first articles to start highlighting some of the problems with medical devices. Any guess as to when that article was published, Jon? Jon Speer: The fact that you teed it up that way would suggest that it might have been before I was born, but I don't know. Mike Drues: Well, I'm not sure about that, but... So the 510(k) was created in 1976, when the FDA first started regulating medical device, this particular article, and we can post a link to it from their website if you like, was published in Popular Mechanics magazine in February 1971. Five years before the 510(k) was even created, people were talking about these problems. There's just absolutely nothing new here. Something to think about. Jon Speer: Yeah, and folks, here, what Mike is saying about the 510(k) process, there have been cries for reform on the 510(k) for a long... Ever since it was released, there's been cries for the 510(k). And, yeah, Mike's right, it's not a perfect process. And if perfect process were the objective, there would never be one, because there's no such thing, it's all about continuous process improvement, to put my quality hat on for a moment. So embrace the pathway, understand the pathway. It's a game of regulatory poker, to borrow a concept that Mike uses, get your ducks in a row, leverage experts in this field. That's why I talk so often with Mike Drews, because he is truly the expert... Well, an expert, I guess there might be more than one, but is one of the world-renowned experts as far as regulatory strategy for medical devices. And folks, look him up, he's with Vascular Sciences. And, of course, as I mentioned a moment ago, safety and performance and efficacy, those are key things for any medical product, regardless of pathway. That means that you have to have solid foundation from a design control perspective, that you have to have a solid foundation for risk. And that, when you go to market, you're gonna need a solid foundation for your quality management system. Jon Speer: Frankly, there's nothing better than the Greenlight Guru eQMS software platform to help you with that. It's designed specifically for the medical device industry, by medical device professionals, so I would encourage you to go to www.greenlight.guru to learn more. And you have been listening to the Global Medical Device Podcast.